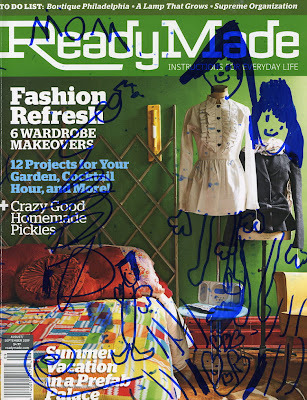 1 sharpie marker + 1 magazine = hours of fun and creativity AND some truly delightful art! I can't take credit for this - Peter came up with this on his own one day when he asked (thank you, Peter) if he could use a sharpie marker and if he could draw on my magazine. He worked and worked and before we knew it he had transformed this issue of ReadyMade into a portfolio of sorts. Almost every page has clever revisions and happy little sketches from top to bottom. Who knew this would be such a hit? Not me. So, this is definitely coming along with us this weekend when we road trip to my sister's wedding (7 hour car ride each way). By the way - I'm am so wishing I had time to whip this up before the weekend! Now comes the swap part, ready? Who has some brilliant ideas for keeping a 2 year old entertained in a car for 7 hours? - because I sure don't. Adam is a happy and fun little guy but he does NOT like car trips. So, I'm a little worried about how this one is going to go. Any ideas would be more than welcome! Next I am sharing a couple more ornaments. I really want to make about 100 of these plaid snowflake numbers. I love snowflakes and the plaid makes them even more fun. Plus I never pass up an opportunity to cover a button. 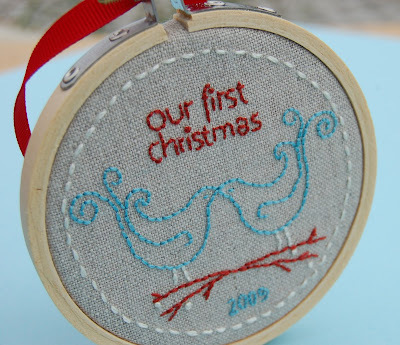 This one will be the third sort of lovey-dovey ornament I have made this year, Not sure why I made so many. 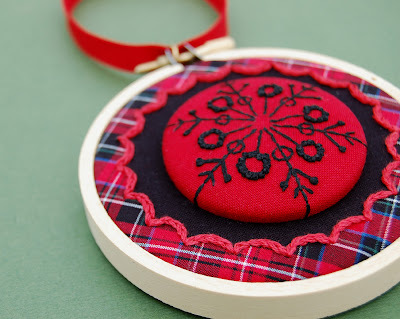 I always buy or make an ornament for Vince at Christmas and I often look for something a wee bit romantic or at least sentimental so I suppose I was just thinking other people might be looking for such sweetness as well. I should be getting some embroidery projects packed up for the long car ride as well. 14 hours of stitching actually sounds pretty great to me. What project would you bring along on a road trip? Annabelle does that sharpie/magazine thing, too! Here's what worked for us when A. was two: a sticker book. We bought one with shiny, reposition-able pages, and every time we wanted to keep her occupied for a while (dinners out, namely, and car trips, too), we bought her a few pages of stickers. She would spend at least an hour peeling the stickers off their pages and sticking them to the book and then repositioning them. It was awesome, and I'm sure it was good for manual dexterity, too. The other thing that occupied her for hours and hours was a magnadoodle. Does your little guy have one of these? Ditto what Melissa suggested -- we, too, used a magnadoodle and sticker books. Don't underestimate the appeal of watching dvds while riding! When my kiddo was that young, the van we had at the time had a built-in VCR (yep, it was more than a couple years ago!) and we watched Toy Story 2 several times during our 7-hr-each-way trip to see my dad and stepmom. He wouldn't nap in the van, but when he was tired he would want to watch the video and he would zone out, which I guess was the closest thing to a nap we could get. We took lots of small toys -- Little People were one of his favorites. I wanted to be sure he had plenty of his stuff with him once we got where we were going, so that he wouldn't be bored there. I rode next to him so I could play with him, and that was a tremendous help -- in fact, I still tend to do that on long trips, though nowadays instead of playing with Little People and magnadoodle and sticker books we play hangman and handheld video games :). Wow, the snowflake ornament is just gorgeous!! Those cheap dollar coloring books from Target and Walmart that have stickers in them. Tag Reader, we got a bunch of those and my two year old especially entertained her for hours. new books from Half Price, if they're new to them, it's still new. small cheap toys you don't mind losing, even better if they're new. magnadoodle or other drawing toy. color wonder- one of my boys filled several of those coloring books, but we didn't worry about it marking up the van like with normal markers. I can't do anything while we are driving as it makes me feel sick, but I always have an embroidery project for stops and rests!! Wow thanks for all the great tips everbody! I'll be taking that advice with me to Chicago and I'll let you know how it goes :). When my kids were little I always had a backpack full of little suprises for travelling. Little toys, books whatever they liked.The dollar store is always good for this. Everytime they got restless I would pull out a new suprise. Now they are 9 and 14 it is easy to travel distances. They handle it better than I do!!! I wanted to add a couple of old-fashioned suggestions for the child entertainment. We sang rhyming songs and poems together and I read stories out loud with dramatic voices etc to my two boys. As for mom, I found embroidery to be the easiest or a repetative crochet pattern. Hope it helps. One more fun thing to tell you. My oldest did all of the kind of drawing your son did in the magazine (which i would encourage again) and he is not an in-demand graphics artist at sixteen. Cool possibilities in the future. wow, these are gorgeous! beautiful stitching and color choices. I've been working on my little house ornaments from last year as well, it's a fun time of year to think about the holidays gearing up. Two year olds are tough. We do a lot of road trips and have a 5 yr old and an almost 2 yr old. For my 2 yr old a ball is the biggest hit. We found a ball with floaty sparkles and she loved that. We also brought her dolly and ponies she could play with her sister. But the biggest thing is food. Mini giinger cookies and pretzels were the biggest hits. I found stickers, movies and books to be better when they get just a little bit older. Eye spy might work well - Eye spy something green and then you name all the green things you can see. Oh yes, projects for mama - I almost forgot! I suggest something small and simple. I rarely want to do something complicated in the car, and you don't have space to lay out pieces of fabric. Planning beforehand is key.